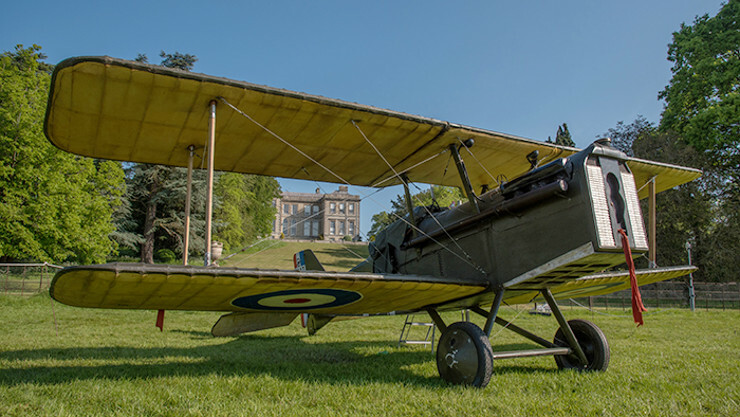 Deep in the Warwickshire Country side, the historic Ragley Hall makes an unusual site for an Air-show. 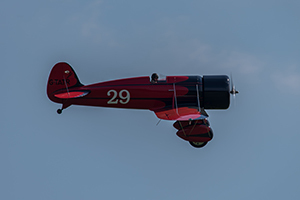 Fortunately, the organisers of the inaugural Midlands Air Festival were able to recognise the unique landscape as the perfect venue for this varied weekend of flying. 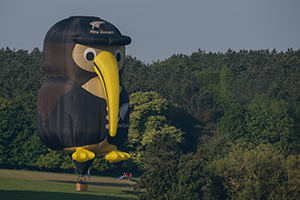 The Victorian parkland with its natural undulating amphitheatre layout made an idyllic backdrop for both a mass Hot Air Balloon launch and a full flying display. 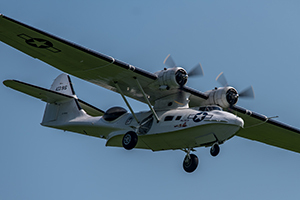 The Great British Weather plays an integral part in the success and failure of any event, the Midlands Air Festival was no exception. Glorious sunshine and very light winds throughout the weekend meant that all 5 planned Balloon launches could go ahead and there was very little disruption to the planned flying display. The event included a Friday evening Night Fire show and two full days of action with the option to camp on site for anyone not wishing to miss out on any of the action. Airscene attended the Sunday show arriving in a timely manner at 5am for the mass Hot Air balloon Launch. We were fortunate enough to witness an incredible 72 Balloons taking to the air simultaneously. This was quite a specular site in the gentle glow of the early morning sun. The perfect weather conditions allowed the balloons to ‘box’ gently around the airfield staying in close formation, a rare occurrence in the ballooning world. 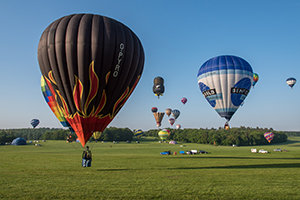 The smell of propane filled the air as the vivid colours of the balloons danced around the beautiful blue skies and contrasting parkland greenery. 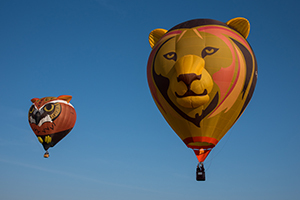 The Midlands Air Festival team had also managed to secure a huge range of ‘Special shape’ Balloons from all over the globe. Those visitors who had made the effort to set their alarms extra early were able to witness Master Yoda, an Angry Bird, a Giant Shuttlecock, a Donkey and a Pirate to name but a few. Later in the day a few vintage Balloons from the 1980’s advertising heyday were also tethered in the arena, including the Mr. 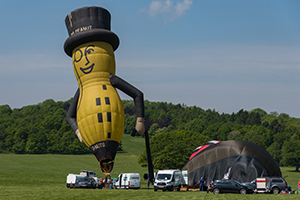 Peanuts balloon pictured below. Sadly, the ‘Berty Bassetts’ pair, one of which is due to retire were only displayed on the Saturday. After a brief lull in the proceedings the Turbulent display team kicked of the afternoon flying with their barnstorming antics. Formed in 1959, flying four 1600cc D31, the Turbulents are one of the oldest display teams in the world. Today, they treated us to formation flying, flour-bombing, pyrotechnics and balloon-popping. 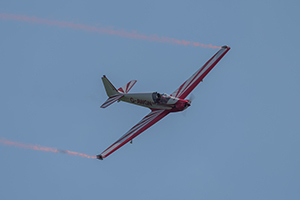 This was quickly followed by two dynamic solo aerobatic displays by Peter Davies in his Calidus Autogyro and Lauren Wilson in her Pitts Special Biplane, both giving energetic and polished crowd-pleasing performances. 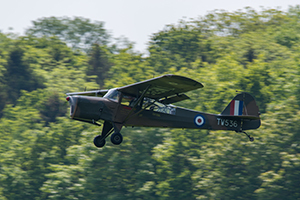 The timings of the display were superbly choreographed, with barely a pause for breath we were quickly treated to a quartet of historic aircraft; The Auster AOP.6 demonstrated its versatile low-speed characteristics in a rarely seen display. 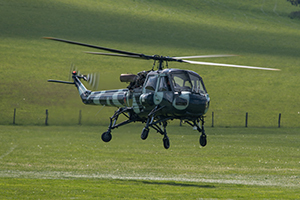 Dr. Terry Martin then showed us why the Westland Wasp was such a beloved helicopter was such a dependable servant during the Falklands conflict. 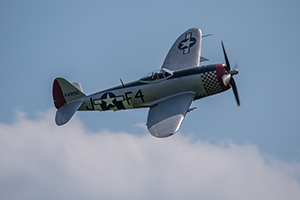 The much anticipated return of the P47 Thunderbolt made its flying debut in new markings complete with D-Day invasion stripes before the Norwigen Spitfire Foundations ‘Sharkmouth’ P51 Mustang whistled above the crowd in one of the most impressive demonstrations of the day. The varied afternoon saw further aerobatic displays from Bob Grimstead in his Fournier RF4, who gave us a graceful, relaxing display. We also saw the Stampe Biplane Team and an unusual Paramotor display. Most pleasing of all, was the BAC Strikemaster. 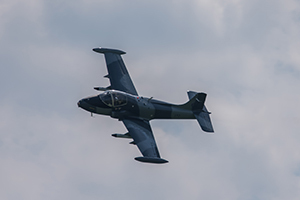 Although this was the only jet of the day it was able to perform a full aerobatic display for one of the first times since the incident at Shoreham. It was great to see the classic jet able to stretch its wings across one of the most beautiful flight-lines on the air-show circuit. 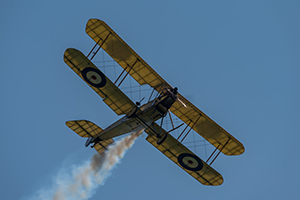 The historic element of the airshow was a real strength of the event; The Great War Team was able to provide the Royal Aircraft Factory BE2 and SE5, whilst the majority of the fleet were on duty in France. Pyrotechnics and mock flak were particularly atmospheric over the unspoilt landscape, providing a haunting tribute to the brave pilots of the First World War. On a lighter note, post-war air-racing was also represented by the Travel Air Type R Mystery Ship with a spirited display of the famous racer. The Second World War was also well represented with the Beech 18, PBY-Consolidated Catalina and North American Harvard. 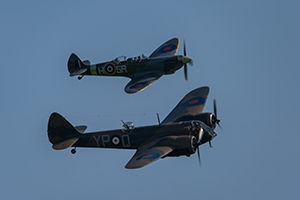 The highlight of the show came in the form of the Aircraft Restoration Company’s Bristol Blenheim & Supermarine Spitfire flying in together in close formation as the ‘Battle of Britain pair’ before breaking off to perform superb solo routines. Fellow Duxford stable-mate the Hawker Fury demonstrated how far the piston-fighter plane progressed throughout the 1940s. 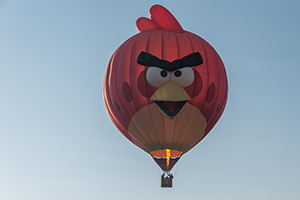 For a first time show, this really was a great effort by the team, an excellent flying display, well-organised Hot Air Balloon Launch and a unique venue made for an enjoyable day out for all. The commentary was informative and catered to the wide ranging audience. Visitors also had the option to visit Ragely Hall itself for a small additional cost and families were able to enjoy a small section of ground entertainment throughout the day. 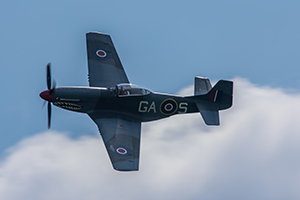 Perhaps with some more support from local stall holders and a display from one of the major RAF teams this could be a major addition to the air-show calendar. 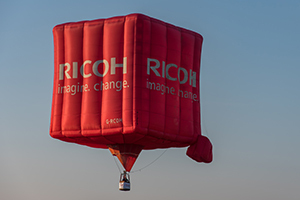 If you have never witnessed a mass-hot air balloon launch then put this one in your diaries for next year.